A week of above freezing temperatures has seen the snow pack dwindle and shrink, reduced now to large patches in shady spots. The ground is sodden, the streams swollen and the air grey and damp. The high hills have been mostly shrouded in cloud. The excitement of the blizzards, the bright whiteness of the snow covered landscape, the thrill of the hard frosts have all gone, replaced by dampness and dullness. No, not dullness, nature is never dull. Just less immediately spectacular, less instantly stimulating, but still interesting. And the most interesting aspect of nature in recent days is the big change to the forest. Wandering through the now soft and subtle woods the aftermath of the heavy snowfall is apparent everywhere. 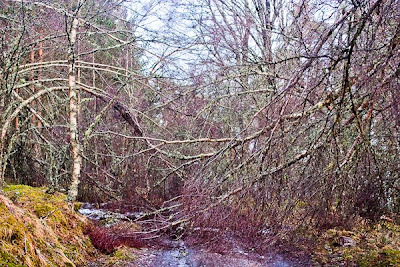 Branches litter the ground; massive boughs ripped off Scots pines high above, thin birches snapped off twenty feet above the ground, aspen split where the trunks divide. Look high into the trees and fresh ragged tears are visible everywhere. Whole trees have been toppled or tipped over to lean at alarming angles. Supple trees like birches and rowan have been bent into great arches. Many tracks are almost impassable, blocked by a tangle of bent, broken and fallen branches. In nearly twenty years of wandering these woods, during which time big wind storms have downed trees and snapped branches, I have never seen such extensive damage before. Nowhere is out of sight of wounded trees. Why has this happened? Because there has not been heavy snow like this, falling in windless conditions and sticking to the trees, in many, many years. Since the last such snowfall the trees have grown, shaking off the lighter snowfalls, until this fall was too big and heavy for them to bear. If it snowed like this every few years the trees would never grow to be so susceptible. Most will survive of course and the scars will soon darken and be less noticeable. The woods will go on. Photo info: Snow damaged birch trees. Canon EOS 450D, Canon EF-S 18-55mm IS@36mm, 1/50@F5.6, ISO 800, raw file converted to JPEG in Lightroom 2. Indeed. In areas with regular heavy snowfall the trees have short downward sloping branches. A microcosm of the power of nature to shape the landscape. Is this why we backpack into the wilds-to experience the reality of the natural world. Not always pretty, sometimes humbling and always awe inspiring! Love the colours in that photo Chris. Has a Monet feel to it. Thanks Mike. The hazy, damp air did give an Impressionistic look to the woods!